This items was intended as a handout for visitors to interpret an individual property. 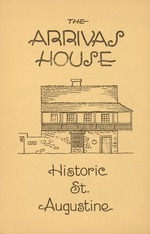 The text in this pamphlet is a reproduction of information from the Historic St. Augustine Preservation Board's "Guide Book" published in 1971.
eral different historical and cultural periods of St.
past, thus presenting a plural cultural image. used as another "room" by-the housewife in earlySt. ing, made soap, washed and performed other chores. Lawns were non-existent and the ground was swept. early Spanish times is the vegetable and herb garden. for use in a variety of ways in cooking and preserving. Restoration carpenter shop from colonial drawings. Spinning is demonstrated on both wool and flax wheels. visitor can also see candles being dipped. .'.. .... :. ...- ,.. :. : .. : . :~,; ii,ii iiii ii ii lii*ii iiiil ia ii !! >ifices andi,, i boardiroomof teHsoiS.Au. .. ... .I N *N ...... .
= i = i = i ==i If= = = iiiil i i! strates the..basi oca construsctionifmethods oith pasat, thspresentin~g a 1L ral #cutural image. ........a fruii ina:pa e@i i ...4.